In 1973, the people over at Omega decided to celebrate their 125th anniversary with something HUGE. The first automatic winding chronograph with a chronometer certificate. And not only that, the watch itself was also HUGE. Even for today’s standards, this chronograph chronometer watch is a massive piece of stainless steel. However, compared to today’s average large watches (mostly because of fashion), this watch has some interesting piece of engineering inside as well. The movement inside this watch, Omega caliber 1041 (based on Lemania’s caliber 1341) is still honored today by a lot of Omega and chronograph enthusiasts. 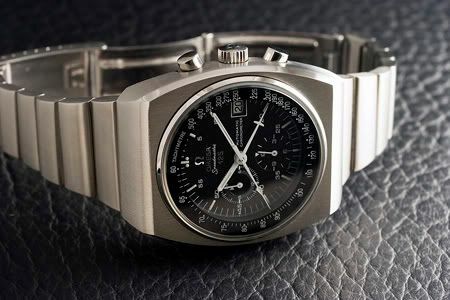 The Omega Speedmaster 125 (ST378.0801) is becoming rare, since only 2000 pieces have been made. Years ago, Chuck Maddox wrote an excellent and a very extensive article on this Speedmaster 125. I don’t think the prices mentioned in that article are up to date anymore, especially not since Antiquorum did their OmegaMania auction tour. You can read his article here. Today, I stumbled across some great pictures of this big (51mm x 42mm) stainless steel chunk. Apparently, the owner (using a nickname that suggests he is a Paneristi) really knows how to photograph a watch, see the picture below. You can see all his photographs in this thread in the Omega forum over at TimeZone, taken by PaneraiXS. 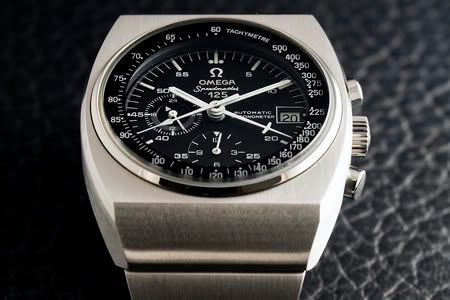 Honestly, I think that Omega Speedmaster watches from that period really breathes a certain ‘true craftmanship’ that they [watch manufacturers] nowadays only can imitate with – most of the time – unaffordable so-called ‘toolwatches’. This is why I love Omega for still making the Speedmaster Professional ‘Moonwatch’ in stainless steel with a hesalite (read: plastic) crystal for a very decent price. Unfortunately, they also create a whole bunch of other watches that I’d rather see them not doing. If you want to step out of the ordinary, leave the current catalogues as-is, and click Chrono24 (for example), to find your own Speedmaster 125 Chronograph Chronometer. Although being more expensive than a few years back, they still go for less than the price of a basic Panerai wrist watch for example. A quick search on Chrono24 tells me that these big ones are for sale for just under 2000 euro. For starters of course, expect to pay more when you want one with box and papers. WatchMunich.com for example, has one for sale in great condition, for 2050 euro.